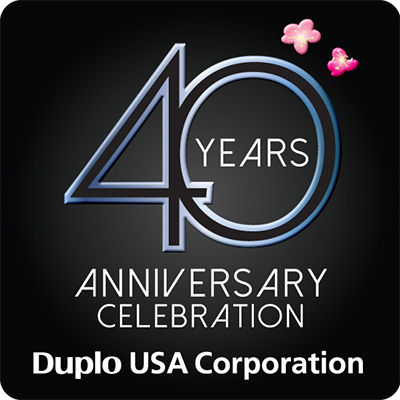 Duplo USA Corporation, Santa Ana, California, has announced it will mark its 40th anniversary with a special yearlong series of events that includes a three-city roadshow and an employee trip to Japan. Duplo USA Corporation was established in September 1979 as the vision of Juko Shima, who had founded Duplo Corporation in Japan 23 years earlier. Duplo USA Corporation spent its first 10 years distributing Duplo’s collators, bursters, decollators, folders and stencil/spirit duplicators while providing input for the development of products fit for the US print market. Forty years later, the company offers a complete range of digital color finishing that includes the raised spot UV coater, slitter/cutter/creasers, diecutters, saddle stitching and bookletmaking systems, flood UV coaters and guillotine cutters. 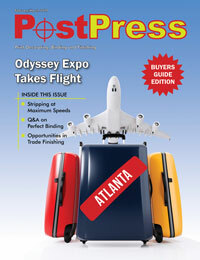 It expanded with corporate headquarters in Santa Ana, California, a warehouse in Ontario, California and a training/warehouse facility in Suwanee, Georgia, to serve customers across the country and in Canada and Latin America. “It’s incredible to be celebrating such a milestone with continued success. Our sales performance over the last four years has been the strongest in our 40-year-old history, and this is an excellent opportunity to thank everyone for their support,” said Peter Tu, president of Duplo USA Corporation. On the company trip to Japan, employees will be treated to a sightseeing tour, as well as a factory tour of Duplo Seizo in Sagamihara and Duplo Seiko in Wakayama. For more information, visit www.duplousa.com.